With wedding season just around the corner in many Western countries, and having lived in both Canada and the UK, I know how competitive the fashion scene at weddings and Asian events can be. Ranging from the heaviest saree to the most classy, what works and what doesn't? What's 'in' and what's 'out'? Scroll down to get a peek into my current picks for you to look fashionable and fabulous at your upcoming events. Florals have been in style for a couple of years now. 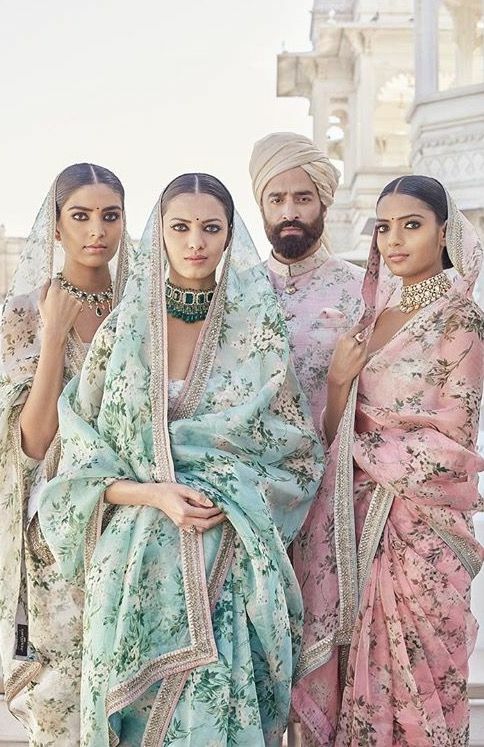 And though we see this trend slowly fading away since it's been done over and over again, Sabyasachi has found a way to still make it look fresh and fabulous. Below, he's taken a vintage floral print and teamed it with pastel colours and the very classic Sabyasachi style of a heavy necklace and traditional low hair bun. If worn like this, you'll always look classic and elegant. Gasp! Black? Yes, you heard me, black. Forget what those aunties say about black being a colour that represents a bad omen (I mean do you really believe that anyways? ), and wear what you want. And black is always in - especially now. I love black in South Asian wear. Whether that be a black silk saree with a gold border (so classy), or a black printed lehenga. Black looks good on everyone! 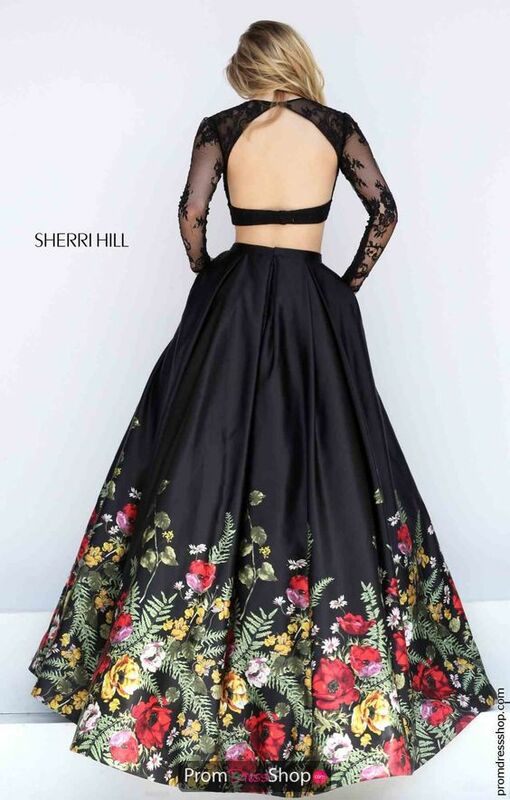 I love some of the dresses that American designer Sherri Hill makes. Yes, I'm aware she's a prom dress designer, but some of her pieces would look fabulous styled like a lehenga- like the one below! Just add a black net dupatta and you're set. The cut-off shoulder look is hot in South Asian and Western fashion. 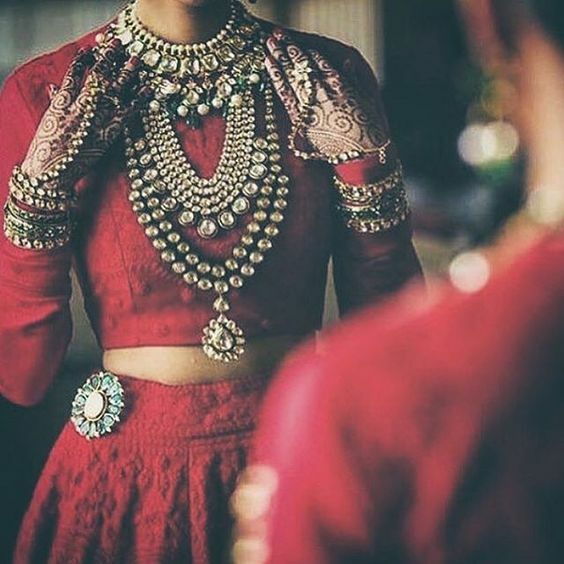 I wasn't a fan of this at first, but it's grown on me, and it looks great when this style of blouse is paired with a lehenga skirt. Arptia Mehta's design below is seamless. Seen all over the Paris runways, fringe is what you want if you're going for the fashion forward look. Add fringe to your blouse along the hem or on the sleeves to really stand out. 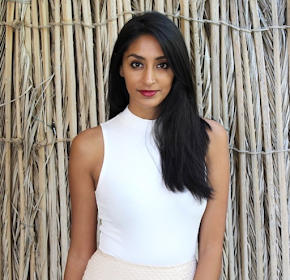 Canadian designer Mani Jassal has a gorgeous fringe blouse in her latest collection. Fitted cut-off trousers paired with a longer top make a beautiful suit. Add embroidery down the side of the trousers, and make the kameez (top) heavier for a trendsetting look. The below suit by Mina Hasan is absolutely stunning. These are my current favourite trends in South Asian fashion, but I'm sure we'll see more and more as the year goes on. Stay tuned for more updates with new hot trends!